Typically slender structures such as columns, trusses, shells and plates are buckling-prone structures. The buckling instability is the result of purely geometrical effects and it does not relate to other forms of non-linearity (e.g. material non-linearity). When an axisymmetric structure (e.g. a cylinder) is subjected to axial compression, under increasing load there comes a critical load value (Pcritical) after which the structure’s response can only take the form of two states in equilibrium. Either a purely compressed state –therefore not exhibiting any lateral deflection- or a laterally deformed state. This point is called a bifurcation point. 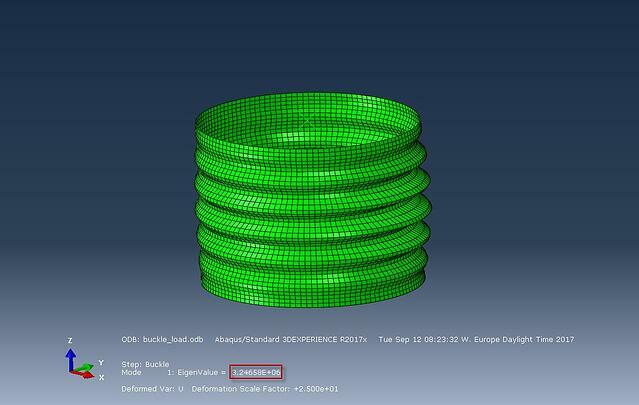 This form of discontinuity prevents in many occasions achieving of convergence for solvers in finite element analyses. 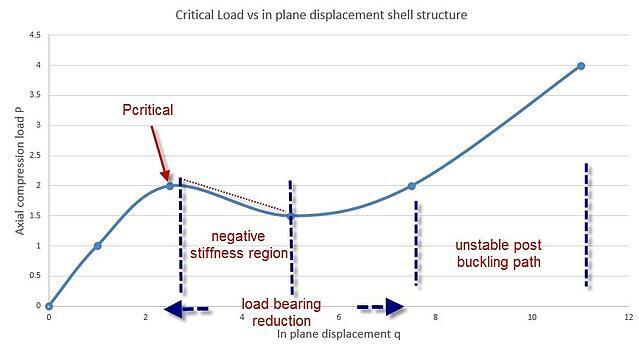 A structure's behavior under loading is usually studied with the use of load-displacement plots. This applies also to studying the structural behavior in the post-buckling region (past the bifurcation point). Two relevant plots (one for in plane and one for out of plane displacement) for a shell structure (e.g. a chimney with a circular cross section, a monopile structure etc.) are given below. Shell structures (structures the thickness of which is relatively small compared to its other dimensions), exhibit a post buckling behavior where negative stiffness occurs accompanied by a sudden load-bearing reduction. See picture below. For a shell structure under axial compression when the critical load is reached , the structure instantly loses its load bearing capacity and exhibits a significant lateral displacement δ (snap). This lateral motion can be quite localized. On each of the secondary paths, the structure exhibits sudden high lateral displacements, jeopardizing its stability as well as its load bearing ability. At this point the structure releases membrane strain energy (accumulated by the axial load) in the form of kinetic energy. 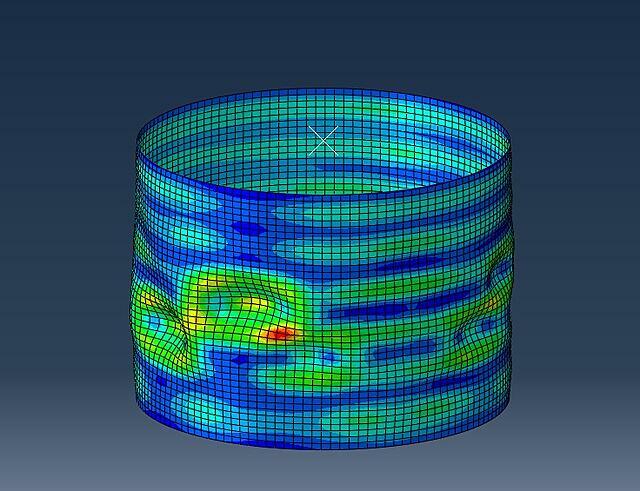 In the post buckling region after a certain value of lateral displacement has been reached, the structure regains its load-bearing capacity and can be loaded further over its critical load value. See picture below. From the example above, it can be concluded that a structure’s behavior in the post-buckling region is of crucial importance for designers and engineers. Different types of buckling-prone structures, exhibit different behaviors in the post-buckling regions. 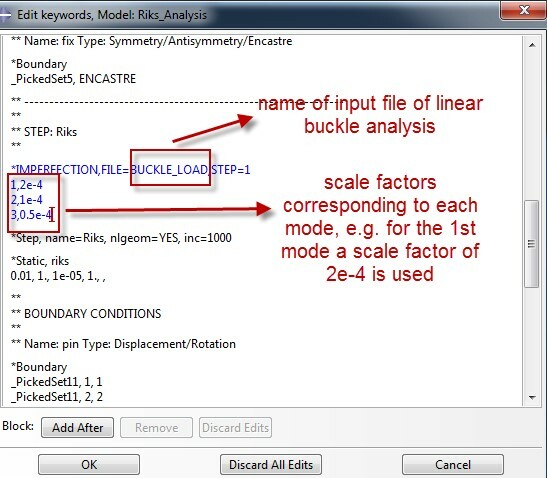 Prior to submitting the buckling analysis job (Subspace solver was used-smaller run times when only a few modes are requested), the node coordinates for the different mode shapes must be written as output. This procedure is shown below. This output will be consequently introduced as imperfections for the Riks analysis so as to achieve a smoother transition to the post buckling region and surpass the bifurcation problem. 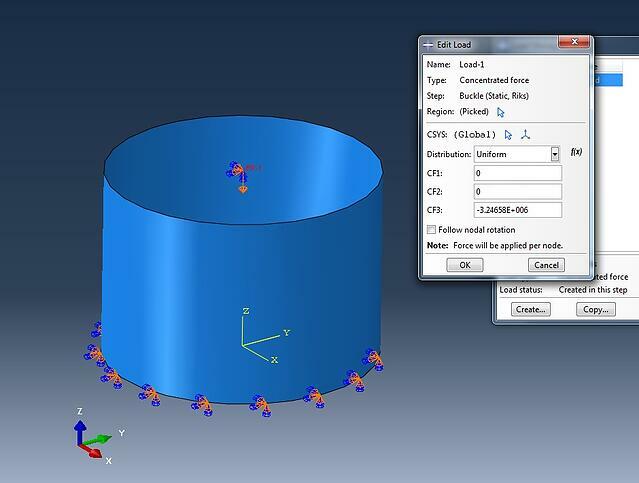 For the Riks analysis, minor modifications must be performed to the model. The NLGEOM flag must be turned on to account for non-linearities. Additionally the unit compressive load must be replaced by the buckling load value predicted by the linear buckle analysis. Last but not least the imperfections must be introduced for the Riks analysis. This is done again by editing the model΄s keywords. Each scale factor corresponds to a scaled shape of each mode (nodal displacements are scaled down). For choosing an appropriate scale factor, a good rule of thumb, is to choose an order of magnitude lower than the shell thickness for the 1st mode (most important of modes) and decrease the subsequent scale factor by half of the first scale factor. Below the stress contours are shown. It can be seen that the structure is at the post buckled region. By plotting the Load proportionality factor (LPF) we can trace the prebuckling and post buckling regions based on the load applied be the Riks algorithm. As demonstrated, the Riks algorithm is a powerful tool for assessing a structure’s behavior in the post-buckling region. By introducing imperfections (either by mesh perturbation or by scaled mode shapes-as performed here-) we achieve a smoother transition to the post-buckling region. The example shown above can be applied when investigating the behavior of imperfection-sensitive structures. 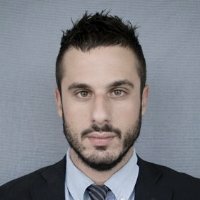 Are you not experienced enough yet, to perform these analyses yourselve?